"Yes, some mistakes were made. Who hasn't made mistakes?" Winfrey says. Oprah Winfrey says she worries about doing "all I could do." Oprah Winfrey earned the rare opportunity to convert her media charisma into a monogramed TV channel. Now she's the one tasked with rescuing OWN, the Oprah Winfrey Network, after a disappointing first year. It's a high-stakes, potentially ego-shattering challenge that could make the strongest woman or man flinch. But win or lose, Winfrey says she relishes the fight to turn OWN's fortunes around. "Yes, some mistakes were made. Who hasn't made mistakes? The real beauty is you can say, 'I learned from that,'" Winfrey said. "I don't worry about failure. I worry about, 'Did I do all I could do?'" The cable channel, which marks its first year Jan. 1, is trying for a fresh start after executive turnover and missteps that proved OWN lacked a solid foundation on which to build, this despite a Discovery Communications investment of a reported $250 million and counting. Viewers snubbed the lineup that skimped on programming and, surprisingly, what should have been OWN's unique weapon of choice: Winfrey herself, whose limited on-air presence will be boosted Sunday with a new weekly series, "Oprah's Next Chapter." OWN has failed to improve on, or in some instances even match, the modest ratings and small audience earned by the low-profile Discovery Health channel it replaced. "I would absolutely say it is and was not where I want it to be for year one," Winfrey said. "My focus up until (last) May was doing what I do best, which is 'The Oprah Winfrey Show,' and giving that my full attention" until its conclusion. But Winfrey, who said management team errors in planning and execution could serve as a cautionary tale ("I was never interested in writing a book. … THIS could be a book"), rejects the idea that a single year's performance will determine OWN's ultimate fate. Or hers. "Somebody was talking to me in that kind of saddened, 'How are you?' tone, and I was thinking, 'I'm fine,'" said Winfrey, 57, who ruled as the queen of daytime TV until she ended her talk show after 25 years and turned her attention to the channel. "I realized the reason people have this tone is they're reading all the press (about OWN), so you see me and wonder if I can still walk. … I am a determined and committed woman. I don't give up. I'm just getting started," she said in a recent interview. One bonus of being Oprah: She has received pep talks from other media movers and shakers. "Everybody has told me — Ted Turner has told me, Barry Diller has told me, Lorne Michaels has told me, David Geffen has told me — anybody who's ever worked with a channel, who's ever done anything, has said it takes three to five years," she said, adding, "You have to do the work. … You do not have to pay attention to the criticism." Year two for OWN will reflect executive changes made last July, when Winfrey expanded her role at the channel by adding the roles of chief executive and chief creative officer to her position as chairman. Discovery Communications COO Peter Liguori had filled in as interim head after OWN CEO Christina Norman was dismissed in the wake of poor ratings. Although the channel's ownership is split evenly between Discovery and Winfrey's Chicago-based production company, Harpo Inc., it is Discovery's money that's on the line. With more scheduling consistency, movies, original series with and without Winfrey, and "a lot more Oprah in general," Discovery is "a lot more confident that we're heading in the right direction," said company spokesman David Leavy. Sheri Salata and Erik Logan, two veteran Harpo executives, were brought on board to share the title of OWN president, with Logan moving from Chicago to OWN's Los Angeles headquarters. Logan said he clearly understands the hard work in establishing any cable channel, and this one in particular. "One of the greatest gifts and challenges is to have her name on the door," Logan said of his top boss. "Everything you do garners a high level of scrutiny and attention. … We don't run from that." The initially slight programming lineup is being beefed up, most notably with "Oprah's Next Chapter." The weekly series debuts 9 p.m.-11 PM EST Sunday with Winfrey's visit to the New Hampshire home of Steven Tyler. "Next Chapter" turns the once studio-bound Winfrey into a globe-trotting interviewer who drops into the home of a Hasidic Jewish family in New York, George Lucas' Skywalker Ranch in California and cook Paula Deen's Georgia estate. There is also a trip with Sean Penn to Haiti, fire-walking with Tony Robbins and a planned India trip with Deepak Chopra. The injection of Winfrey on-screen, not just in the executive suite, is sorely needed, suggested one industry analyst. "The biggest mistake they made is, if it's the Oprah Winfrey Network, where's Oprah?" said Bill Carroll of media buying firm Katz Media. He compared OWN's Winfrey vacuum to programming the Court TV channel without courtroom shows or the Major League Baseball channel without games: "After a while, viewers stop going," Carroll said. OWN has averaged about 136,000 viewers a day, a drop of 8 percent from what Discovery Health drew in 2010, although it's up slightly in total viewers in prime time and has seen an 8 percent increase among women ages 25 to 54, part of the channel's hoped-for demographic. Winfrey also is on-air with "Oprah's Lifeclass," which draws on her talk-show archives, and "Oprah's Master Class," a series of high-achiever biography specials. But, she said, she never "was supposed to carry the channel on my back, and it never was supposed to be about me being on the air as much as possible." Instead, O magazine, with Winfrey as monthly cover girl and articles reflecting her better-life philosophy, is the intended model. She attributes the channel's rough start to a more basic error: The lack of a "library" of programming for the many hours of airtime not filled by original shows, compounded by overconfidence about her market value in general. "I don't understand what anybody was thinking. You're going on the air, you've got four shows. What do you think you're going to do by Tuesday? Did they think people were going to turn on the channel just because it had my name on it?" she said, sounding almost eager to cast doubt on her drawing power. "People didn't turn on 'The Oprah Winfrey Show' because my name was on it. It was absolutely topic driven every day," she said. Such modest expressions aside, Winfrey's involvement clearly is key to the channel's success. She's glad to make the commitment, she said. As her longtime boyfriend Stedman Graham told her, she'd be bored silly today if she'd taken any lengthy break after ending her daytime show. Discovery is also in it for "the long term," said spokesman Leavy, citing the three to five years that other cable channels have needed to develop audience-grabbing hits and firmly establish themselves. He declined to specify what Discovery has spent so far on the venture, calling media estimates high. But he pointed to long-term advertising contracts with major companies including Procter&Gamble, and hopes of new carriage fees from cable providers that have been airing the channel for free. Viewership that has been lower than expected, however, has meant "make goods" in ad time for sponsors. Winfrey, who describes herself as obsessed by ratings for the first time in her career, said she's giving OWN "everything I've got. I've spent more energy doing this than anything I've ever done in my whole life." With good reason. 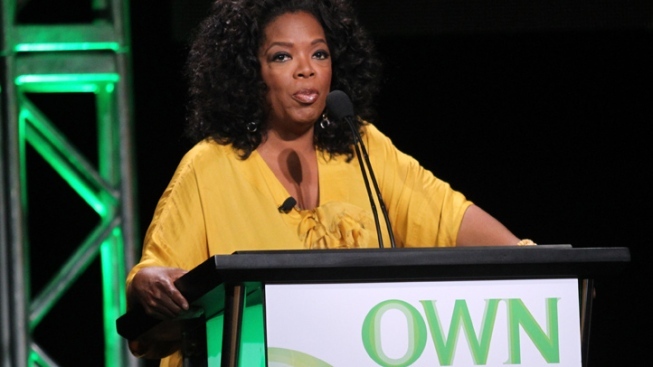 "I walked in today (to OWN's offices) and felt uplifted to see my name on the door, Oprah Winfrey Network," she said. "Just to … be able to sit in a room with a team of people presenting you with ideas — what a gift that is." It has also made OWN her ultimate responsibility. "Every third week, someone new was in charge, and now she's in charge. From where I sit, this is going to be her success or her failure," said analyst Carroll. Winfrey claims to have an unlikely sounding Plan B if the channel falls short. "If this doesn't work out, I'm going to go into organic farming in Maui. And I'm not kidding."